Same killer fuzz pedal as the original, in a smaller design. Listed under Satriani's Fulltone artist page and listed among Satriani's gear in [this article by Premier Guitar](https://www.premierguitar.com/articles/26665-joe-satriani-dont-even-think-about-it?page=2). Bottom-left corner, that's an Octafuzz. At 7:49 you can see the Octafuzz in James' pedalboard. According to Gem Archer Gear's pedal rundown, Archer uses the Fulltone OF-2 Octafuzz pedal. "Fulltone Octo-Fuzz. I was recommended this one by Gem, it’s a VERY Gem Archer sound. Also very Neil Young. If you want to know how it sounds, play “Sons of the Stage” by Beady Eye, all the lead playing is going through this. It kind of ‘overwhelms’ the guitar sound and makes it sound like a herd of rampaging buffalo. maybe that’s why it reminds me of Neil Young." 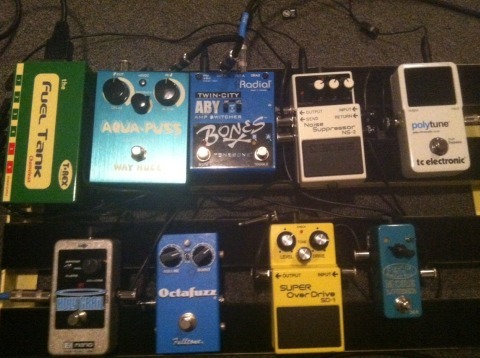 An Octafuzz can be see at the bottom of Alex's pedalboard in this shot. This image comes from an [article](http://www.pastemagazine.com/blogs/lists/2012/05/14-guitarists-talk-about-their-pedal-boards.html) from *Paste* magazine. Fulltone's [website](http://www.fulltone.com/artists/scott-henderson) states that Scott uses an OF-2 Octafuzz. In this photo of his new "GigRig" pedalboard, one of the pedals that can be seen is the Fulltone OF-2 Octafuzz pedal. Right at the front row of Ruban's pedalboard, the Octafuzz can be seen. Oz Noy lists all of his current gear, including this one on his website. At 2:03 the cameraman gives a close-up to his pedalboard and there is clearly a OF-2. The Fulltone OF-2 Octafuzz guitar effects pedal is the only exact circuit copy of the legendary Tycobrahe Octavia on the market. With this killer fuzz pedal you can achieve cool octave-up sounds ala Hendrix's "Band of Gypsies" and SRV's many live shows, while the fuzz delivers just what it says: classic fuzz tone. Housed in a 14-gauge steel enclosure with a beautiful Ranar-blue gloss powdercoat finish and Antique-white logo, this Fulltone Octafuzz pedal is the reincarnation of the Tycobrahe. Its synth-like ring-modulation and "steel-drum" vibe will turn heads. I was searching for Fuzz pedals, I don't really care about the octafuzz tone, and checked the Big Muff and other common Fuzz pedals, but they all sounded and felt very wild and uncontrollable. The Octafuzz just delivers a very controlled fuzz tone which I love. Also if I ever feel like playing with a very uncontrollable Fuzz sound, I just engage my BD-2 and voila, Big Muff sound. Maybe the best Octafuzz out there. I was researching into octafuzz pedals for a while and somehow decided to get the MXR Submachine Octafuzz pedal. I started to play around with it and noticed a couple of things. One, there was way too much feedback to the point where I was compelled to buy a noise gate pedal. Second, the octave feature was always very present when engaged and I couldn't find a subtle sweat spot for it. I was also just disappointed with the fuzz tone overall and was wanting a more classic blues pedal instead of a smashing pumpkins fuzz. I didn't have to look far to see that my blues rock idols were all using the Fulltone Octafuzz so I eBayed a used one to my house. I did originally have trouble figuring out that this pedal has reverse polarity so I had to find a reverse polarity cable and plug it into its own isolated pedal power supply. After that it fit right onto my board and instantly added that classic fuzz sound I was looking for. The octave function was beautifully subtle I could even play chords with it switched on and not hear a tremendous difference. The boost knob is quite responsive and you have much control over it as well. There's lots of tones in-between 12 o'clock and the boost being all the way up. I love it and while I also have an MXR 108 (modern fuzzface essentially) it is a completely different fuzz that have a bit more umph and crispness to it. I love it. I'm sure I'll keep it for a long time. really great fuzz. i also use it as an OD pedal by turning the drive on the pedal down and turning the vol on my guitar down, then when i crank the Guitar up during a solo the fuzz really comes in, it's really perfect. So blues, so Gary Clark Jr! I couldn't be happier with it!